Another trip to the Maeklong River saw Tim Webb from Palm Tree Lagoon and his friend fishing for Giant freshwater stingrays in Thailand. After stingray fishing throughout the morning with no results the team moved to a different part of the river. Soon floats were in position in readiness for the arrival of the Giant freshwater stingrays and high tide. It wasn’t long before one of the floats burst into life and the anglers were attached to a large Giant freshwater stingray. 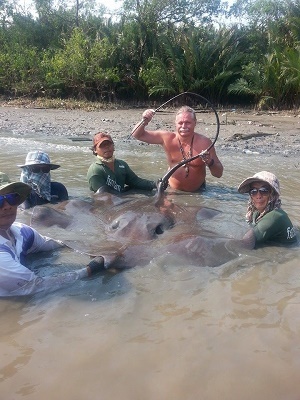 A one hour battle followed which saw the Giant freshwater stingray continually clamping onto the riverbed. Continued pressure applied from above finally took its toll on the fish and it was slowly brought up through the water and over the waiting net. The Giant freshwater stingray was measured at a width of 1.5m’s and was estimated to weigh 135kg’s. The Giant freshwater stingray was released back into the river after a short period for recovery.